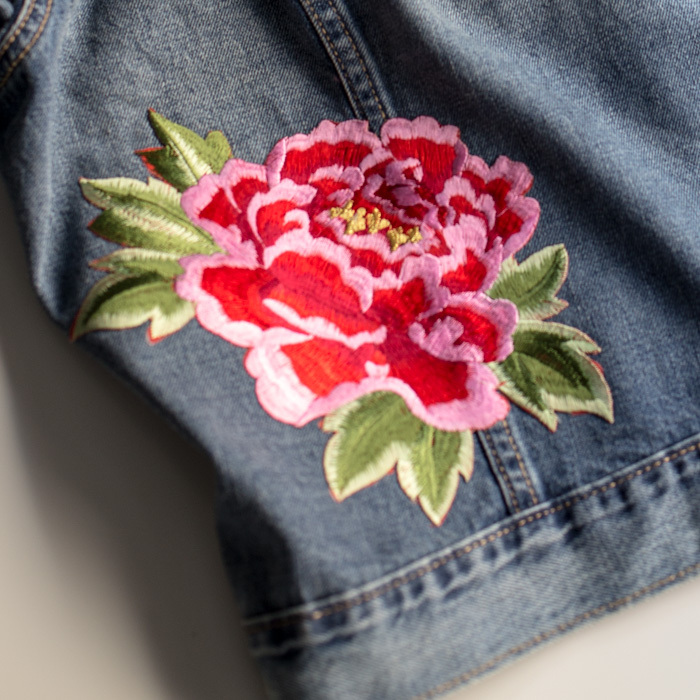 You’re going to love this fun DIY embellished jean jacket. Denim makes a fabulous, neutral back drop for almost any sort of decoration. As a result, the possibilities are endless. 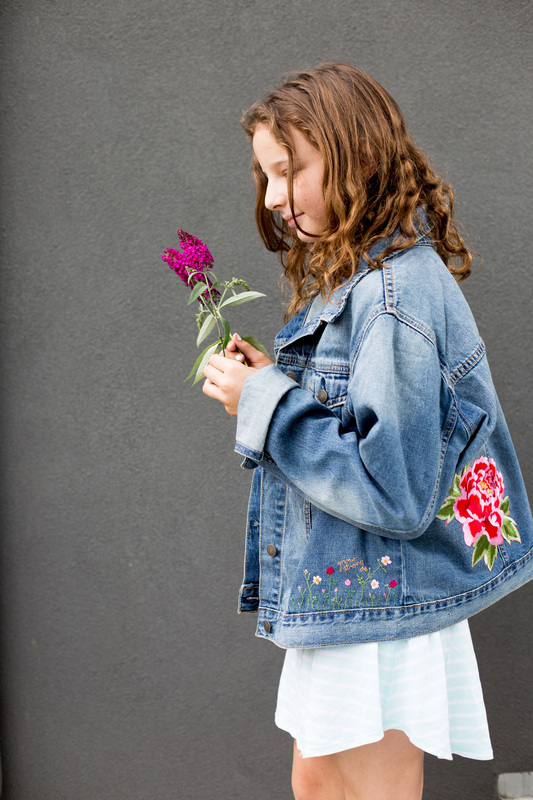 Make this embellished jean jacket personalized for the perfect back-to-school addition to your wardrobe. I wish I could show you my brainstorming notebook of all the fun things I wanted to add to this embellished jean jacket. Allie started jumping up and down at the possibilities. Needless to say, we have a jean jacket for her lined up with all sorts of things planned, including tassels, crochet edging, a dog iron on patch, flowers, stars, and lots of sayings and quotes. Almost surely, we will need a little editing for her version. For my version, I settled on a motivating saying across the shoulder with a pretty hand embroidered floral addition to the front. These words across the shoulder remind me to be brave and ask for what I want, but also just to go get it done. No hemming and hawing and delaying with all my perfectionistic tendencies, but more of an execute-and-execute-now mentality. I wanted my version of the jacket to be fun and funky, but simple and pretty, too. First, I started by hand-embroidering “get it girl” across the back. Doing this by hand allows for flexibility in font choice. See the how to below. I love having the unique script instead of the typical patch letters. Certainly, there are a lot of available patch letters if you want to go the fast route. I chose colors that complimented the jacket, but also that matched the applique rose I found. Next, I added the rose to the back. Ironing-on the rose patch was fantastically fast. So fast, in fact, the entire jacket can be done in a half-hour or less if you stick just to patches. You can find lots of floral patches online. I liked these thistles, too. Also, think about all the sports clubs, favorite characters or symbols that you can find all over the internet. My daughter and I decided that making an embellished jean jacket is a lot like getting any tattoo you want, but without the permanence. Finally, I added the hand embroidered flowers. This sweet little floral design with “grow strong” compliments the large flower and saying in the back, but on a smaller scale. The color-scheme is the same, but the detail of this embroidery seems like just the thing to finish off the jacket. The PDF pattern for this embroidery is below. Use it also on other items that need embellishing, like hand towels, aprons, totes or pillow cases. :: Using desired font, print out saying in desired size. Cut and place on jacket. 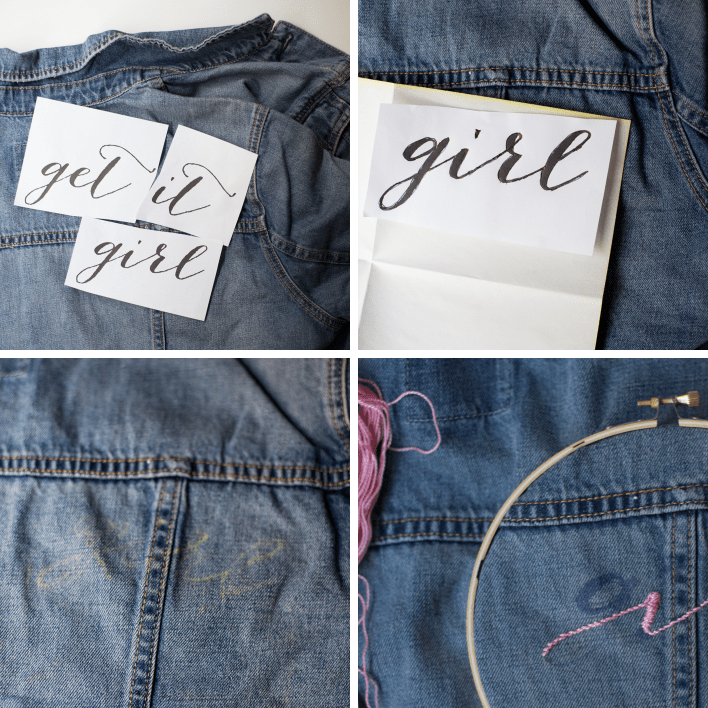 :: Use embroidery tracing paper and a pen to transfer words to jacket. Put fabric down, then tracing carbon paper, then desired shape or word. Draw over shape or letters with a ball point pen to transfer design to jacket. :: The carbon tracing paper method lets you see it fairly well. However, the more intricate the design the more difficult it can be. If you’re having trouble, you can use sulky solvy as another transfer method. With this, you trace the design to the material and stitch right through the material to your fabric. Then, it melts away in water when you’re done, which is pretty awesome. :: I like to go over my carbon transfer with a air soluble marking pen, so I can see it as clearly as possible. Use the stem stitch for thin lines and the satin stitch to cover wider areas. See here for embroidery stitch basics. 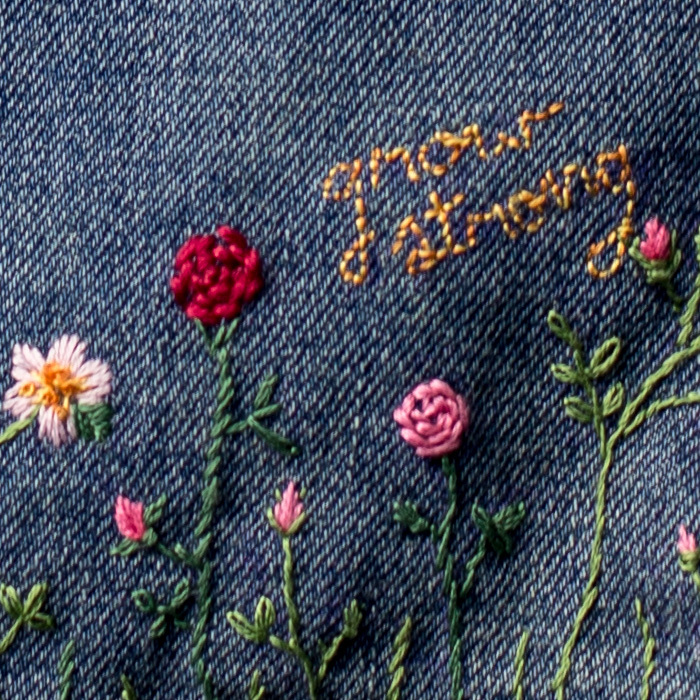 Here is a close up of the embroidered flowers from the front panel of the jacket. Find the PDF design here. Find a summary of basic stitches here. Stems: Use two strands of DMC 25 (it comes with six strands in the floss) and stem stitch. Leaves: Embroider with two strands of DMC 25 and the lazy daisy or detached chain stitch. Buds: Use two strands of DMC 25 and the satin stitch to form the bud shape. Use green to wrap around the bottom of the bud with a straight stitch. Open wild rose: Embroider with two strands of DMC 25 and the satin stitch in each petal. For the center, use a straight stitch and french knots. Long stem roses: Use the full 6 strands of DMC 25, and make overlapping straight stitches in a circle shape. For the iron on applique patch, use the hottest iron you can get, with no steam. First, place the patch in desired location. Next, place cotton pressing cloth between the patch and the iron. Finally, press down on patch for 30 seconds without moving the iron. Try to cover the whole patch with one iron press. Otherwise, repeat until you have covered the entire patch with heat evenly. Also, turn your fabric over and repeat from the other side of the fabric. Enjoy your new favorite jacket! Anne Weil of Flax & Twine created this post on behalf of MarthaStewart.com as a Contributor on September 23, 2016. Have fun exploring my profile and work there. The PDF link for the embroidered flowers design isn’t there. Or if it is, I have missed it. Could you please repost it? Thank you so much. The jacket looks amazing! Hi Lydia, I sent it to your email, but the link to the PDF is up in the list of materials. Nice jacket. I like your blog. You share the right information about jeans jacket. Embroidered patches on jeans jacket is really nice. Looking beautiful. Nice blog! Cute jacket. Exactly what I’ve been looking for. I couldn’t find the pdf for the small flowers on the jacket front either. Is there a downloadable pattern for them or did you free hand them? Thanks Jean, I explain the pattern and what I did, including templates up above. They’re all linked to in the materials section. Could you please give the PDF of the big flower? can’t find it anywhere!! please help! I’m so glad you like the coat. The big flower is actually a patch. I’m pretty sure I linked to it or a similar patch in the materials section of the tutorial. Good luck! Hello! I love what you did! It’s beautiful! I have been working on embroidering my own jacket for a while now, but always get discouraged because my hoops never stay on. Did you have trouble keeping your hoops on with the thick jean jacket seams? If so, how did you combat it? Thank you! Hmm – I didn’t have much trouble with the hoops. I think the hoops fit over at least one seam. Do you have the wood kind with the screw? sometimes you can find ones that have more give (i.e a longer screw).